Located right on Highway 3 just south of Seven Stones, Hugging Tree is on the east side of the valley facing due west. The driveway is all gravel and leads straight up to the wine shop in the middle of the 68 acre vineyard and orchard owned by Cristine and Walter Makepeace. The southern end of the Similkameen Valley is quickly becoming the hot spot for new wineries in that valley. Seven Stones and Forbidden Fruit have long been a part of the scene there but were often a little remote for some travelers to the valley. That shifted a little with the opening of The Vine Glass Resort near Forbidden Fruit and now there is another winery that has opened its doors in the deep Similkameen south. You aren’t going to find these wines easily anywhere else so this is the best place to try through their collection. This is the Similkameen at its best – rustic charm, beautiful scenery, and small, family run farming where everything is done with quality of the wine in mind. It’s a small-production boutique winery with a real country feel. The wine shop is new and welcoming. The view from the front deck is beautiful and shows the southern part of the Similkameen Valley very well. Great wines, great conversation, and a peaceful easy feeling. There is nothing rushed about this wine shop and I really enjoyed my visit there. (The fact that Brad also plays music and enjoys riding motorcycles may have helped a bit as well…) The big mirror behind the bar recalls an old west saloon and the windows let in lots of light to see the wines well. The front deck is just screaming for an old rocking chair to watch the sunset. It’s what a winery would have been like if there had been boutique wineries 100 years ago. Don’t get me wrong – It’s not a kitschy old-west theme park kind of place. This is the real deal. Brad is a pro and seems very comfortable behind the bar which I learned was from spending years behind bars in Whistler. The result is a real, honest, wine shop experience with a social aspect that will have you kicking the “social” right out of “social media”. 1 white, 1 rosé, and 3 reds are the wines currently in the Hugging Tree portfolio. Brad is a strong believer in Viognier and the first 2013 vintage is a beautiful representation of what that variety can do in this part of the world. It has big aromas and excellent balance – not flabby or overly soft like other viogniers out there. The Rosé is bold without being over the top, dry, and lovely – everything a tasty rosé should be. The Telltale and Moonchild Merlot were both solid reds as well. As I was visiting early on in the season on a weekday, the Vista was not available for tasting although I did buy a bottle on a friend’s recommendation on twitter earlier that day. Look for it on one of my “Tonight’s #bcwine…” tweets in the future. Have you been there? Let me know if you visit Hugging Tree by leaving a comment below. What can I say about the Similkameen BBQ King that I haven’t already said before? For starters, in this podcast at least, I just shut up and started listening to what others had to say. Other media people and other attendees at this year’s competition. As always, it was tons of fun. As always, the food was top notch. As always, it was the most entertaining food and wine event that I’ve ever been too and nothing has really matched it in my mind. There were a few new competitors this year and the weather couldn’t have possibly been any better. Yes, it was hot. But we here in the Okanagan find that normal and enjoy it when it cools down to 32 degrees. All of this made this year’s BBQ King the best one that I have ever attended. This podcast contains lots of people – chefs, attendees, and media types. I actually managed to corner Anthony Gismondi, Anya Levykh, and Kayla Bordignon who all offered their own unique perspectives on Similkameen wine and the experience of attending the BBQ King. Sit back, relax, and enjoy the sounds of the Similkameen’s best (and maybe BC’s best) wine and food competition. For the complete multimedia experience, pour some BBQ sauce into a small dish and smell it occasionally as you listen. Or don’t. You know, it’s just an idea. This week’s podcast is all about the new wineries in the Similkameen valley, which seems to be where my motorcycle takes me frequently for some reason. 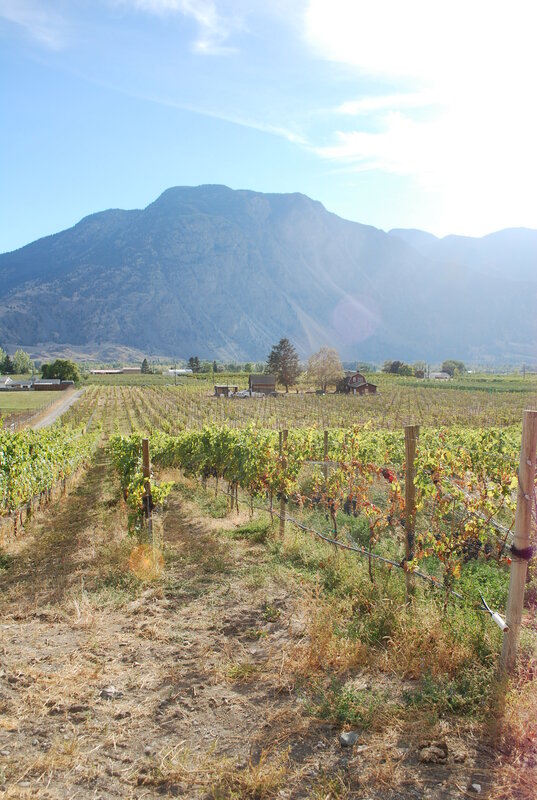 It also features a new winery from the Similkameen Valley called Courcelettes. It’s the Baessler family’s vineyard and winery, which is named after their home town of Courcelettes, Switzerland. They are not new to the BC wine world and if you’ve been a fan of the Pinot Blanc from Clos du Soleil over the past few years, you should really be keeping your eye out for Courcelettes’ wines in stores. Click over to their website for more information about their wines and history. Charlie gave me this wonderful bottle of their Trivium and that’s the wine that Calli and I are tasting in this podcast. I also bought a bottle of their red blend called Menhir with the intention of using it for a podcast or video but somehow it got imbibed for dinner with friends and, well, that’s how it goes. Since recording this podcast, I noticed that they have their own ‘official’ highway sign up on Route 3 going through Cawston. Just to give you an idea as to where it is, it’s in the same neck of the woods as Eau Vivre but on the other side of the highway. Their website says that they are open from Thursday to Monday 11-5 so try stopping in on your next travel through the Sim. I know that’s where I’ll be heading as soon as I can. It’s wine touring season again! Time to squeeze up to the wine shop bar, taste a few wines, buy a blingy t-shirt with a half-case, and head to hotel lounge before dinner. Wine country touring can sometimes feel a little more rushed less vacation-like at times, but the fun is always there for you to find. Here are a few of my tips from the many seasons spend touring and living in wine country. Firstly, there are seasons to wine touring. The busy season generally runs from mid-May (Victoria Day weekend) to Thanksgiving in October. The truly crazy months are July, August, but September has been punching above it’s weight class in recent years and October is remarkably busy for the Fall Wine Festival. Expect crowded wine shops at this time of year unless you know this: Wine touring secret #1: wine shops are not as busy in the mornings. You can get all the help and information you want from wine shop staff at that time and all without having to jostle for a place at the bar. If crowds and getting more than an arm-width at the bar is more for you, this is a good thing to know. Tour early, have a long lunch, then maybe head back late afternoon when it starts to slow down again. Call ahead though because sometimes smaller wineries don’t open until later in the day. The shoulder seasons (March break to May 24 and Thanksgiving to Christmas) are also good times to get in some quality wine shop time. Again, some smaller wineries may not be open at this time of year, so check their websites or call ahead to make sure they are open. Only middle to large production wineries (those are the ones with big parking lots) are open in the winter but it seems that there are more wineries trying out off-season hours. If you’ve ever toured in the winter, wine shop staff (who are usually owners or managers at that time) are more than happy to chat with you for as long as you want. Wine touring secret #2: Wear comfortable everything – shoes, shorts, shirts, hats, whatever.There are very few wineries that offer comfortable places to sit. Shoes are important and well as clothes for the heat (in the summer) or layers (for the unpredictable spring and fall). Hats are especially valuable in all seasons, especially when the sun is out. In most places the sun “shines” but in the Okanagan summer, the sun “beats down” more often than not. (At my very first job at a winery, I noticed that I was the only one sitting in the sun during a lunch break – everyone else was in the shade. I mentioned it and a coworker said, “You know, I’m kind sick of summer.” He might as well have said, “You know, I’m kind of sick of oxygen” but I learned to understand it the more I lived here. The heat and sun can be oppressive here at times. Another thing to not wear: perfume, hairspray, or scented products beyond light deodorant. You might think that you are blending in but trust me, you would stand out less in a wine shop wearing day-glo pink unitard and a sombrero. People who work in wine shops use their noses, a lot. We smell wine everyday. We can tell when a glass is truly clean by how it smells (it shouldn’t smell at all). It’s not just the people behind the bar though; anyone who has spent a day or 2 with their noses in glasses of wine will be more tuned into that sense, and they will find it distracting as well. Interestingly, I find that synthetic odours (perfume, etc) will stand out and interfere with wines’ aromas more than natural ones (mild body odour, bouquets of flowers, etc). Looking south from the northern edge of Clos du Soleil’s vineyards. Mostly from the sun. The interior of a car can heat up to dangerous temperatures before you even get to tasting the reds. Wine left in a car can heat up and will “cook” in minutes. Ever wondered why the wine doesn’t taste the same when you get it home? That might be why. There are 2, maybe 2.5 wineries in the Okanagan, that have any shaded parking at all. Kudos go to Silver Sage and Mission Hill for planting a tree or two. (Honorable mention to Cedar Creek.) The problem has more to do with the fact that trees create shade which is not what vines need – they need sun. I have personally walked through vineyard where the grapes closer to trees (i.e. in shadow part of the day) ripen weeks later than vines that are farther away (no shadows ever). Wine touring secret #3: Bring a big, warm blanket. It seems weird in the summer, but it isn’t. Keep your wine on the floor of your vehicle (the lowest and therefore coolest part) and insulate it with the big blanket. That keeps it out of direct sunlight and gives you a chance to make it through the tasting before the temperature in the car gets to the wine. Don’t forget to use your car’s air conditioner between stops. This should be stupidly obvious by now. Since most tourists aren’t comfortable spitting wine (which is totally acceptable – that’s what the pro’s do), you need to have someone drive you safely where you’re going. If you are doing multiple days, take turns being the DD. Many wineries have added special perks for the DD of a group. Wine touring secret #4: Buy a wine for the DD at every winery you visit. It’s a great way to say thanks and also keeps them involved in the touring experience. I’ve seen DD’s wander around the wine shop and miss out on some of the great conversation at the bar. Also, there’s no harm in just smelling the wine and you can learn a lot about a wine that way. The other option is to book a trip with one of the valley’s many wine tour companies. Most will take you around to wherever you want to go and even have some great ideas on wineries that you may not have heard about. (Well, not you personally, because as an avid Wine Country BC.ca reader / listener you are already most likely ‘in the know’…) Look for a podcast featuring interviews with local wine tour operators coming soon. Here’s a shocker: Wine makes you hungry. At my WSET classes years ago, only a visit to my favorite sushi restaurant right before my class could keep me going through the 2 hours of tasting and talking about wine each week. Even that was no guarantee however. Wine, for whatever reason, stimulates our digestive system and we react accordingly. Plus, eating between wineries refreshes your palate and can really extend your wine tasting day. Wine touring secret #5: There are some great local bakeries, delis, and coffee shops in all of the towns from Osoyoos to Lake Country. Non of them have paid me for advertising though, so you’ll have to search for them yourself. Pick up an assorted selection of eats for the day – breads, fruits, and cheeses can go a long way. Bring a bag or a picnic basket to use or just store them under that big warm blanket next to the wine. You will be much happier that way, even if you go for meals at winery restaurants. Snacks between wineries also helps to cleanse your palate so you can try even more wine. That’s how the pro-wine tourists like myself build up endurance. Practice makes perfect. So there you go, wine touring secrets from someone who has done my fair share of touring for over a decade. Leave a comment if you have any other tricks or secrets that you’d like to share. Welcome to BC Wine 101, where I will focus in on a different wine region in each episode for anyone who is interested in learning about BC wine, including the wine bloggers who will be traveling to Penticton for the Wine Bloggers Conference coming up in June. The Similkameen Valley is beautiful, and not in an easily identifiable, normal way. There’s something about this valley that is almost other-worldly. It’s difficult to really explain the place that the Similkameen Valley occupies in terms of BC’s wine industry. 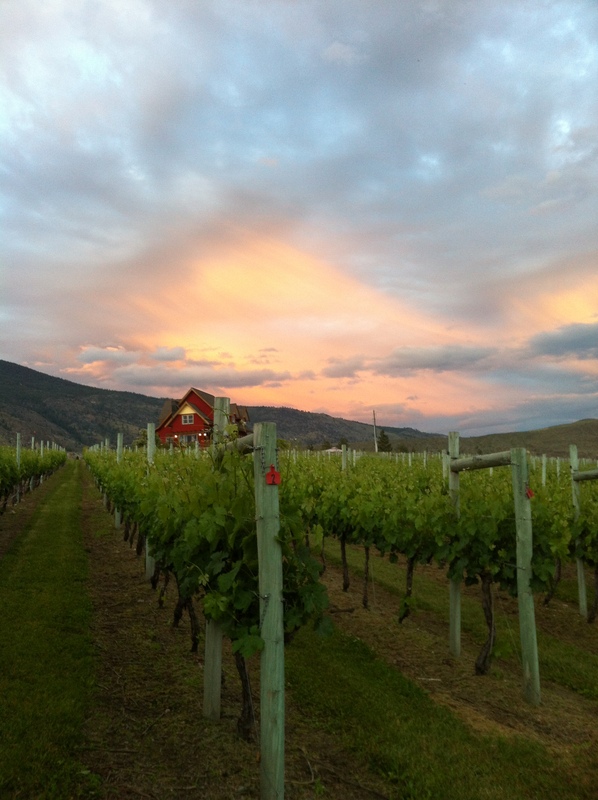 The terroir is not as studied as the South Okanagan and the reputation does not precede it like the Naramata Bench. Just like the wineries of the Columbia Gorge AVA from last year’s Wine Bloggers Conference, the Similkameen Valley is the little region that is often overshadowed by the more renowned neighbor and only people in-the-know understand that there is an amazing party going on there with wines that will blow you away. The Similkameen also happens to be the home of one of my all-time favorite wine and food events – The Similkameen BBQ King Championship. I’ve recorded a podcast at each of the last two events (check out 2011 or 2012‘s posts and podcasts) and each time, the beautiful location of the historic Grist Mill heritage site, the amazing collection of local wines, and the Okanagan and Similkameen’s top chefs competing for bragging rights makes for an unbelievable event you won’t soon forget. Even driving through the Similkameen is unforgettable. Imagine what the wines taste like from this unique place. Joining me in this podcast are Similkameen Winery Association Chair George Hanson and Marketing Director Kim Lawton. The Similkameen river from the patio of Forbidden Fruit Winery. Wine shop breezeway at Orofino, and winery built with straw bales. Rhys Pender, MW, sometimes takes the operatic approach to wine tasting. If you have wines from Clos du Soleil in your cellar, consider yourself lucky. And smart. Because you probably recognize an age-worthy wine when you taste it and have recognized it in the wines produced by the Similkameen Valley winery Clos du Soleil.The exclusive tasting that was hosted at the end of this year’s fall wine festival showcased just how age-worthy these wines are. Tasting through 5 vintages each of the Capella White and Signature Red guided by Rhys Pender, Master of Wine, was a spectacular and unique experience on its own but was made more thrilling because it all took place outside the wine shop, just steps away from the vines themselves.Tasting notes for each of the wines tasted that day will be available on Clos du Soleil’s website to help all of their customers decide when they would like to open their cellared bottles. This podcast contains more of the conversation, cogitations, and ephemera that seem volatilize like aromas when glasses get swirled in truly special occasions like this. The lucky gang of tasters.